After ten years of intense negotiations, China and Australia finally signed a free-trade agreement (FTA) that will strengthen economic ties between the two pacific nations. This FTA is mutually beneficial given both countries’ complementarity. Canberra’s primary sector will continue to woo investors eager to satisfy China’s appetite for commodity and agricultural products. While the threshold on Chinese investments in the country down under, for instance, will increase from A$248m (US$225m) to A$1.1bn. The main beneficiaries of this bilateral trade liberalization are Aussie dairy producers, because current 20 percent tariff and safeguard on Australian dairy products such as baby formula will be removed within 4-11 years. This reduction will be a boon to these farmers who have been at a disadvantage in comparison with their Kiwi competitors, who have enjoyed preferential access to the Middle Kingdom since 2008 when New Zealand signed a FTA with China. Due to recent botulism scare that hit Fonterra, the New Zealand dairy giant, Aussie exporters could use this opportunity to increase their market share in China as consumers search for replacements. Similarly, South Africa should pursuit a FTA with China to diversify its trade partners and kick-start its tepid economy. Chinese Vice President Zeng Qinghong raised the possibility of a China-SACU (Southern Africa Customs Union) back in 2004, however, talks have stalled due to Pretoria’s mistaken assumptions of unfair Chinese trade practices. According to the South African Revenue Services, China makes up 90 percent of Asian imports to South Africa and 33 percent of its exports. Since 2009, Beijing has surpassed the United States and became Pretoria’s largest trading partner. Last year, for example, total trade between the two Brics nations totaled more than R270bn and is growing rapidly. South Africa’s main exports to China are primary products, while it imports mainly manufactured products such as machinery, clothing, telecommunication equipment and footwear from the East Asian nation. 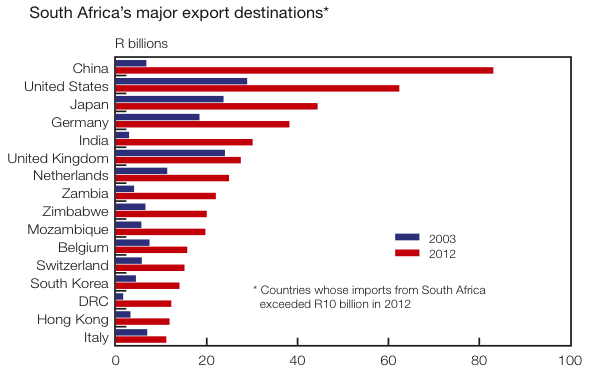 Although this growing trade imbalance has raised some alarms about South Africa’s trade deficit and the purported destruction of its manufacturing sector, which has decreased from 19 percent (% share of GDP) in 1993 to 17 percent in 2010, it would be unfair to solely blame this so-called de-industrialization on Chinese imports. High labor and production costs, lack of access to credit, costly regulations, infrastructure bottlenecks, and lack of adequate research and development (R&D) have contributed to South Africa’s shrinking secondary sector. 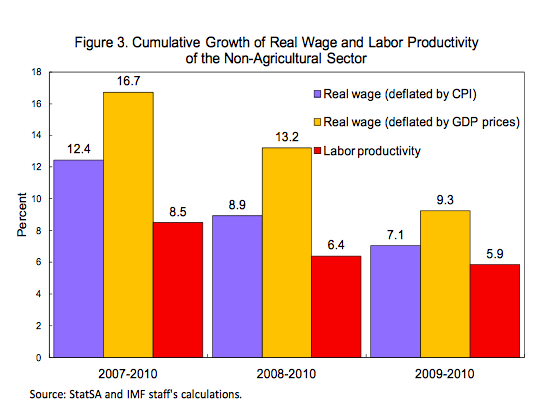 As illustrated by the charts below, real wage growth of union members is relatively high making South African products less competitive in the global market. 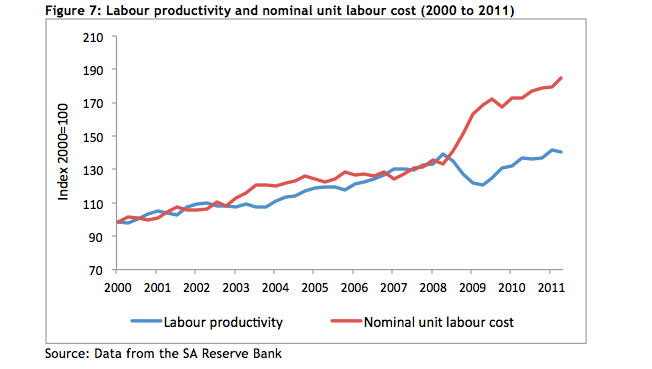 More importantly, flagging productivity growth (not Chinese or German imports) is the real culprit in the Rainbow Nation’s current dismal economic condition. The top Chinese salespeople of L’Huguenot winery—who each sold at least $32,000 of the wine, earning them a trip to the South African vineyard—quaffed Chenin Blancs and Shirazes here last month Collectively, they sold 1.5 million bottles of L’Huguenot in China last year. By next year L’Huguenot, a Chinese-South African joint venture, hopes to launch a cheaper varietal that its South African chairman thinks could double his sales. “China is where our future lies,” said Hein Koegelenberg as he presided over the red-faced revelry. Another area where both countries will benefit is foreign direct investment (FDI). On one hand, South African companies will gain better access to China’s growing services sector, which is expected to balloon as the country experiments with the Shanghai Free Trade Zone. Chinese investors, on the other hand, will gain better access to South Africa, a gateway to the region. “China’s foreign direct investment in Africa’s second-biggest economy leaped from 340 million rand in 2005 to 50 billion rand in 2012,” stated South Africa Reserve Bank deputy governor Daniel Mminele. Chinese investments have also created a total of 11,000 jobs in industries such as cement, auto, and technology services. Similar to European firms such as BMW, Chinese companies could increase their investments in South Africa to take advantage of the country’s preferential trade relationship with the United States under AGOA, which is slated to expire later next year. Slow economic growth in Pretoria’s historical trade partners in the European Union has had a negative impact on its economy. As a result, it is imperative for South Africa to diversify its trade partners and embrace China as Australia recently did. Of course, a FTA with China is not a panacea, and offers several opportunities and challenges. Beside diversifying its trade partners, South Africa would join the majority of Cairns group member states that have signed a FTA with Beijing. However, Pretoria has also to implement critical reforms to liberalize its rigid labor sector, improve investment climate, and education quality to entice firms searching for skilled-labor. A China-South Africa FTA, which can be further discussed next year when South Africa hosts FOCAC meetings in Durban, will provide several benefits to consumers in both countries. President Zuma should put the interests of the country ahead of his party allegiance to trade unions (ANC is in a tripartite alliance with the South African Communist Party and COSATU). Moreover, as China’s labor pool dwindles and its unit labor cost continues to rise, South Africa could benefit further by enticing these firms.